Historian on the Edge: What do we mean by ‘Interdisciplinarity’? For reasons unconnected with the project I came back to this recently. 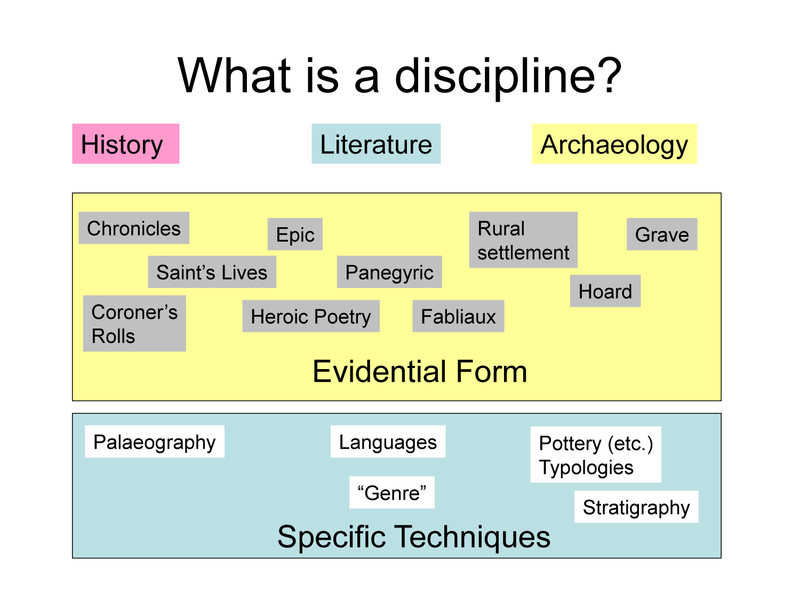 As I have seen it alluded to a couple of times on other medieval blogs and as I think it is a clear statement of my current views of the subject, and of methodology, I thought it might be worthwhile to post it here. It was orginally given at the International Medieval Congress in Leeds in July 2009. At the time what struck me was how many people came up to me afterwards and said they agreed with me, before revealing that they hadn't really understood what I was saying at all... Ho hum. Netwise, Jon Jarrett has a nice summary on his Blog, but he seems (to me) to see me as taking sides with those who think that historicist dominance is either a "good thing" or the only way of doing things, in that he appears to perceive an opposition between me and Eileen Joy. Insofar as I am aware of Eileen's stance (critical theory over historicism), I think I'd be on her side - politically at least. Interdisciplinarity is one of the most used words in our professional practice, sprinkled generously to season MA course and programme descriptions. 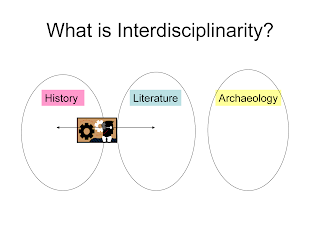 At York some moderately serious thought has been devoted to what interdisciplinarity might mean, but, if one probes what it means in practice, it is not interdisciplinarity at all, but interdepartmentality, something rather different. 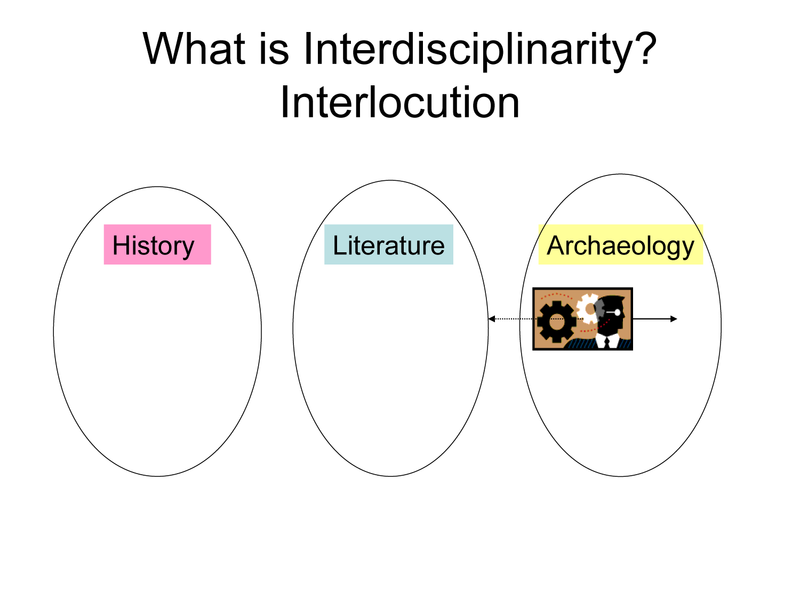 In funding applications it is now more or less the law of the land to use the word interdisciplinary somewhere. No matter that one needn’t actually explain how this will be achieved in practice. I know; I have traded in this bankrupt stock for many a long year! And finally, as we all know, in modern British universities (especially my own, apparently), whenever two or more shall be gathered together, they shall form an interdisciplinary centre. Interdisciplinarity is a cherished myth of medieval studies. In John Arnold’s handy primer, A Short Introduction to Medieval History the ‘interdisciplinarity’ of the topic is cited as a reason one should do medieval history, although ‘its practitioners fret periodically about what interdisciplinary might mean’. I am going to do more than fret. 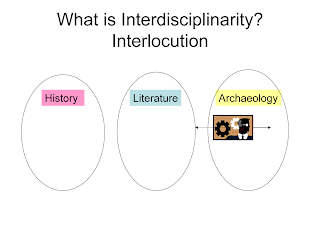 I am going to argue that genuinely interdisciplinary exchange has had important results but has had its day – perhaps killed by its own hand; at least as far as it relates to relationships within medieval studies, the word interdisciplinary has now become meaningless and should be rigorously challenged at its every usage. Such challenges are, further, absolutely vital for the intellectual health of our studies; so-called ‘interdisciplinarity’, rather than being an enabling ‘jewel in the crown’, has in fact become a ‘Bad Thing’, which threatens to stifle approaches to the written and material remains of the so-called Middle Ages. 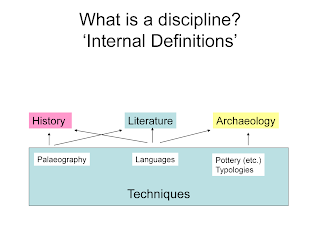 To be interdisciplinary one needs to have some idea of what constitutes a discipline. What, one might ask, differentiates a discipline from, say, a technique or a skill? There is I suppose a standard ‘obvious’ answer at a basic level, which would equate a discipline to the sort of thing that a modern university department is named for: English, French, History, Art History, Music, Philosophy, Archaeology and so on. But this brings a lot of problems. Such is the demand nowadays to be considered interdisciplinary that one hears some very strange (if – in this context – nevertheless understandable) claims. Here are three, which I’ve encountered. If you study medieval literature in English and French are you being interdisciplinary? Can you claim to be interdisciplinary in History and Latin? If that is possible, then any literate historian is interdisciplinary, in history and whatever language or languages she reads, including that which she speaks! Can you be interdisciplinary in palaeography and English or history? Is palaeography a discipline? If so, you could be interdisciplinary in archaeology and pottery typology. When does a skill become a discipline? Archaeology has fought a long battle – whose outcome is still far from universally conceded – to be considered a discipline rather than an ancillary or auxiliary skill or science. What we mean by discipline is, I suspect, those learnt skills, techniques, or mental disciplines, about how to extract information from a body of data, which I would agree are essential (I’m all in favour of method and technique). We could call this the internal means of defining a discipline – things that unify it from within. Of course there are many complex and difficult skills involved in understanding Latin (not just in terms of the actual language but in the rules, the metre etc. of Latin composition), or Old French (similarly), or palaeography, or pottery typologies; it’s not my intention to denigrate any skills or disciplines. But then there are also difficult and complex techniques involved in studying the Prose Epic, or the Coroner’s Roll, or the Saint’s Life, or the grave, which differ (sometimes considerably) from those involved in the examination of fabliaux, charters, chronicles, or building plans. One could also add things like the historiography of the study of a period or type of history, and so on. The interpretative skills or techniques involved in studying early medieval history differ from those of late medieval history, let alone modern history. Once one thinks like this, any body of evidence has its own discipline, stands at its own intersection of specialist knowledge, skills, traditions and historiography. 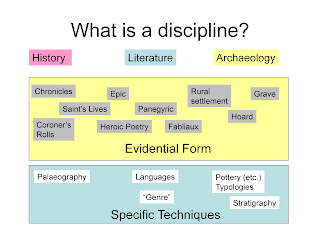 When the idea of discipline retreats into skills-sets, then any of the supposed disciplines that make up our ‘inter-disciplinary’ centres begins to fragment fatally into myriad smaller subject areas and you can be meaningfully interdisciplinary in fabliaux and epic, or in chronicles and saints’ lives. 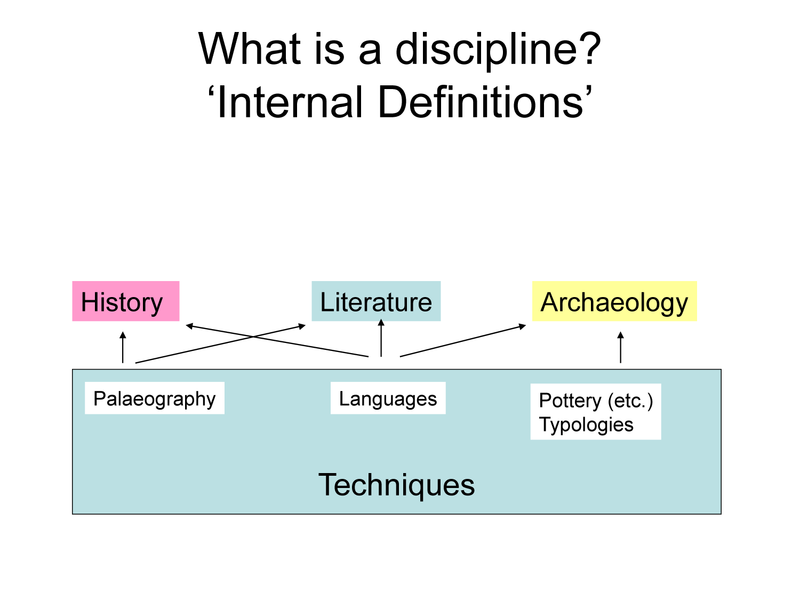 Disciplines, by this definition begin to crumble from the inside. The only way to salvage much from this mess would be to limit the disciplines to those using radically different forms of data: material cultural, pictorial, or written. Even that poses problems. Now, I should confess at this stage that I’m generally excluding those areas which don’t have a place as such within medieval studies; for an historian like me that means things like anthropology and sociology. These have played an important role in developing historical understanding but they do raise the question of what counts as genuine interdisciplinary credentials. Most putative interdisciplinarity comes in two forms. First, and best, is the person – an historian, for argument’s sake – who is interested in the work of a different discipline – let’s say anthropology – talks to its practitioners and incorporates it in her study. Is she really interdisciplinary, though? She is still working ultimately in one discipline, but borrowing, sometimes (but less commonly) exchanging, insights. This has had important results. I don’t deny that, although I would say that a series of other issues emerge, which there’s no time to discuss – the most significant is that of the outcome, to which I will return. Second is the situation one frequently finds in archaeology. Here the researcher reads something of what people write in other disciplines and claims status within his own discipline by reporting on that – yet without actually engaging with the practitioners of the other discipline or, usually, using it in any work within his own discipline. This is not interdisciplinarity, this is interlocution. 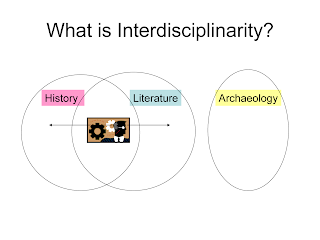 The true interdisciplinary scholar is surely someone who is more than a borrower or an interlocutor, who actually works and publishes in two different disciplines, being recognised as a fellow-practitioner in both. This person is as rare as claims to interdisciplinarity are common but there are some. There are archaeologists who have carried out anthropological field-work, for example. 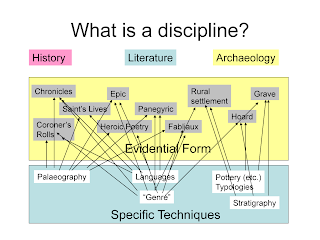 To return to the disciplines that make up Medieval Studies and thus the thrust of my argument, if disciplines do not, on close inspection, seem to have much internal cohesion, one might still maintain that there are ‘disciplinary’ lines drawn round groups of types of evidence that band them together into more meaningful, larger disciplines. One might call that an external definition, based on what is excluded and included. This notion can be attacked from several directions. The bounds of disciplines are difficult enough to define when considering subjects as different (superficially at least) as history and archaeology, as I have written myself. When thinking about what one might call the textual disciplines – literature and history – the problems are multiplied endlessly, and it’s on these that I will concentrate. I’m also approaching the problem from the perspective of someone who knows immeasurably more about the development of the discipline of history than he does about the growth of the study of literature. The canon of sources incorporated within a discipline is historically contingent. What constituted a historical source initially depended upon historians, for good or ill (for not everyone was agreed on this), differentiating themselves from the more literary/philosophical modes of Enlightenment historical production. Writing history wie es eigentlich gewesen ist meant only using the sources that told you wie es eigentlich gewesen ist; those serious documents that told you about high politics and religion. Many – legion – were those excluded on these grounds. At least, however, the canons of historical and (as far as I am aware) a literary ones were clear (leaving aside the large number of written sources considered insufficiently literary or historical!). Clearly, though, once one got into the twentieth century and reached the Annales School and Total History, the historical canon began to include anything and everything that was written down and many things that weren’t, as well. Even Trevelyan’s very un-annaliste Social History of England entitled its chapters ‘Chaucer’s England’, ‘Shakespeare’s England’ and so on. Similarly, movements in literary studies soon moved away from the nineteenth-century canon of ‘high literature’. I read on page 1 of Derek Attridge’s The Singularity of Literature that ‘all attempts since the Renaissance to determine the difference between “literary” and “non-literary” language have failed.’ Thus defined, the boundary between ‘history’ and ‘literature’ has long been permeable, something only underlined by recent theoretical trends. One could, alternatively, take a Foucaldian approach and look at how the disciplines emerged. Foucault thought that one of the defining things about the episteme of modernity, ‘the age of history’ as he called it. By ‘history’ he didn’t just mean the discipline, but ‘historicity’. This, in his reading was part and parcel with the creation of distinct histories of distinct things, with the rise of scientific method, of empiricism, with the creation of disciplines. But, in Foucault’s view (as I understand it) it also produced a concern with the inter-relationship between things, not just their classification. In those terms one could contextualise interdisciplinarity itself within the episteme of modernity, just as, as I would argue, the collapse of interdisciplinarity might be located within the episteme of post-modernity. This would underline the artificiality and contingency of these divisions and point the way to how and why they are no longer valid. Alternatively again, you could take a Derridian philosophical approach and question those boundaries. It seems to me that the bounds between disciplines are subject to the same critique, on the same grounds, as genres were in his essay on ‘The Law of Genre’. The bounds of disciplines, like the bounds of genres, are only acknowledged as existing because they can’t actually exist. They cannot be policed or patrolled. Their very existence implies their own transgression. To make the problem more acute, the developments of theory over the past twenty years have in any case removed whatever might have been left of any boundary between literature and history in terms of ‘focus’. Since the so-called linguistic turn, older ‘social science’ approaches to history have been on the back foot and even many of those who claim an opposition to so-called post-modernism have actually incorporated – or at least have had to pay attention to – ‘textual’ or ‘literary’ approaches to their written data. At the same time, especially in medieval studies – and here I must confess to not being as sanguine as the session’s organisers about the acceptance of ‘theory’ – pretty much all of the dominant – and even less dominant – approaches to literature are in one sense of another, historical: so-called ‘New Historicism’, Marxism, Post-colonialism, gender studies – even in some ways and to some extent Queer Theory. In my understanding at least, it looks to me as though the hard-core ahistorical, literary or philosophical approaches to medieval literature are as much on the defensive as old-style historical empiricism or cliometrics. In theoretical terms, the two disciplines often seem hardly different at all. This was where real literary/historical interdisciplinarity had its moment, its importance and – I concede – its valuable results. The upshot, though, is the eradication of the possibility of further such interdisciplinarity. One must ask what exactly a New Historicist from a literature department and a ‘post-linguistic-turn’ historian bring to the putatively interdisciplinary table, other than technique – charter diplomatic and poetics, say? Since data-specific technique – skill-sets – alone can’t, as we’ve seen, divide one discipline from another, then one really must question whether this is interdisciplinary at all. Is it different from the collaboration of two people from history departments with different specialist skills? I have nothing against collaboration, which is fruitful and important, but we should be honest about how we describe it. The bounds of the disciplines collapse from the inside and the outside. 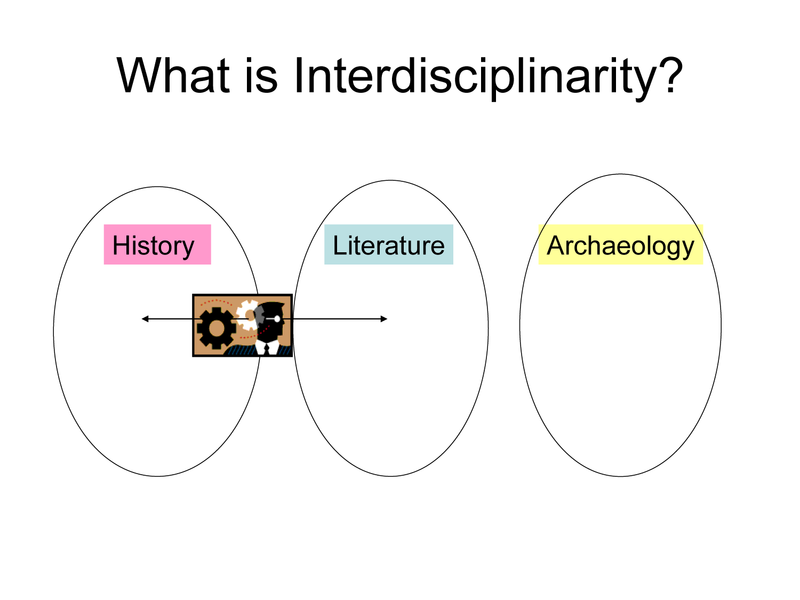 There can thus be no such thing as interdisciplinarity. Sharp-eared listeners might have concluded that, with the genuinely interdisciplinary scholar defined as someone who has published work within two disciplines, accepted as such by practitioners of both, and with real interdisciplinarity denied in the interplay between disciplines based on the primary written text, what is going on in this paper is just me staking a claim to be the rare real deal. I suppose, to some extent, that is right! But only in a very limited sense; it might be the case in a narrowly methodological way. I will now, however, completely undermine my own claims to be interdisciplinary at all. We must consider the outcome of interdisciplinarity. If I take my own work, which adopted what I have called – no less problematically than any other term I’ve derided today – ‘multi-disciplinarity’, the analytical separation of different data-sets and the merging of conclusions at a higher level than is usual, then I still have to ask myself what I produced at the end of the day – if it wasn’t just good old-fashioned social history? What emerges from the literary approach to history or the historical approach to literature if not straight cultural history? Once ‘context’ is assigned importance, history, as I see it, always wins. Perhaps this is because in spite of historians’ claims, the Rankean empiricist ideal still underlies pretty much all historical work. There have – perhaps understandably – been no real moves to produce history in line with the pre-Rankean ideal of history as ‘philosophy teaching by example’. Furthermore, the kind of explanation or causation that contextualism implies is (in my view) unsatisfying even from a historian’s point of view. So I wonder if, whatever one might say about method, whether it is even possible for the outcome of so-called interdisciplinary dialogue, to be interdisciplinary. Is it ever anything other than cultural history of one form or another? I’d even suggest that centres of Medieval Studies don’t teach interdisciplinarity at all, but a single discipline, of medieval studies, which means medieval cultural history. Obviously, I have nothing at all against cultural history – it’s what I do – and at the level of method and approach, what is currently considered interdisciplinarity has produced enormous quantities of valuable and groundbreaking work; I’m not denying that. I don’t doubt that in some, perhaps many, areas of the study of the past, work using the ‘inter-disciplinary’ approach is far better than it would have been had it not used that method. But when it becomes the only approach, I start to worry. The dominance of interdisciplinarity has I think become pernicious. It has produced the requirement to assert interdisciplinary status that leads to the sort of vapid claims that I mentioned earlier. Even ignoring the problems with justifying the term, the ascendancy of historicist approaches and the ensuing de facto dominance of cultural history, jeopardises any approach which isn’t interested in this outcome. It is already the case that most funding bodies stress so-called interdisciplinarity and I suspect that successful bids are overwhelmingly those using this buzz-word. This endangers the funding of ahistorical approaches to literature or of historical projects that do not require the method, impoverishing both. The ubiquity of so-called ‘interdisciplinarity’ threatens to make the academy less, not more, diverse. What is at stake here is how one draws and defines the dividing lines on the map of the academy, and what is involved in intellectual exchange. I suggest, might be a more meaningful way of thinking about the fruitful confrontation of difference – a more interesting way of drawing the lines that sub-divide academia – is the confrontation of theoretical approaches. This is why I offered this paper for these sessions. I can’t think of a single word for the confrontation of theoretical approaches unfortunately! 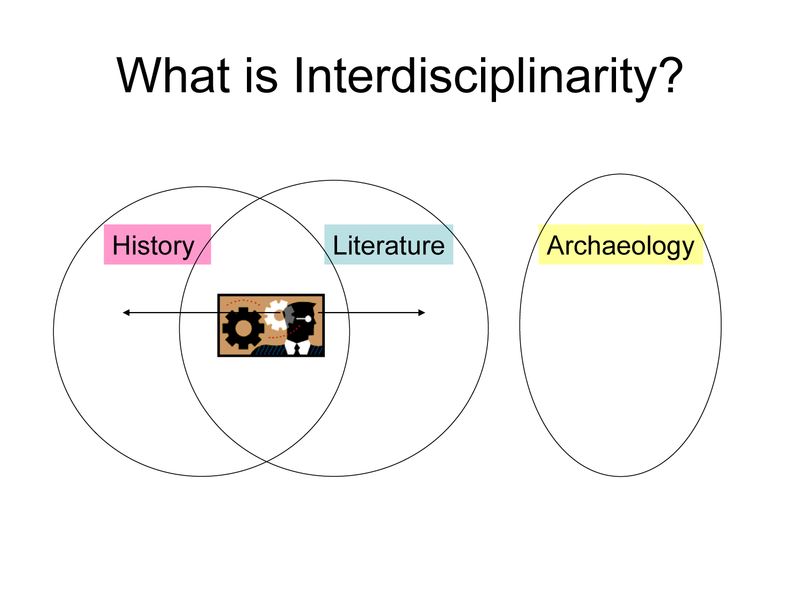 But whatever it is, it renders disciplines/interdisciplinarity irrelevant. Discussion between a die-hard Lacanian and a historicist might involve people from different departments but if it did it would really, intellectually, be no different from debate between an ‘old-style’ social science social historian and a post-linguistic turn cultural historian within a department. I do think that this would be a more fruitful way of dividing the field of medieval studies and giving credit to really intellectually difficult – challenging – discussions. There are two advantages to this, as I would see it. First, the difficulty – the challenge – of such confrontation opens far more the mind to what Derek Attridge calls the ‘alterity’ involved in the creation of work. He is talking about literature, but I think the point might stand more generally. Second, while so-called interdisciplinarity tends, as I have argued, to lead one way, however fruitfully in its own terms, to cultural history, the confrontation of theory might be conducive to more fruitful dialogue – two¬-way, as the word implies. If theory is – as it is – a way of seeing, rather than something to be applied, mechanically, it is something to be engaged with and refined, and this can be done from two points of view with an outcome, I suggest, that, as well as producing better theory, also reflects back, in different ways, on the areas whence those points of view started, rather than producing a single, merged, synthetic, effectively uni-disciplinary outcome. So, my conclusion is not to outlaw or denigrate interdisciplinarity, as such, but to be much clearer about the what it is, its limits, and what it does – and the limits to that – and thus to challenge this ubiquitous demand for all scholars and all work to describe themselves/itself as ‘interdisciplinary’. On the one hand, I suppose, I do want to see value returned to work that isn’t interdisciplinary, but mostly I want to suggest a way forward which valorises engagement at the level of the development of theory, not under the empty rubric of interdisciplinarity.